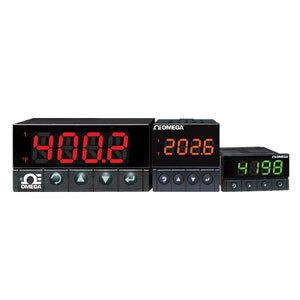 The OMEGA™ iSeries meters with alarms offer flexibility in process measurement and alarm applications, accepting 10 different thermocouple types, 18 RTD combinations or 4 process voltage/ current inputs and providing 2 relay alarm outputs and a large multicolor, programmable display. Easily configured options include 11 different alarm conditions. Front panel configuration buttons allow the user to select the type of input, the alarm conditions and the resulting display color. Process inputs are fully scalable, supporting virtually all engineering units with a selectable decimal point providing a perfect solution for pressure, flow or other process inputs.Standard features include a built-in 24 Vdc excitation source for transmitters or other devices and a universal power supply that accepts 90 to 240 Vac. A low power option is available that supports 24 Vac or 12 to 36 Vdc. Plug into the DPPT panel meters for modbus connectivity.